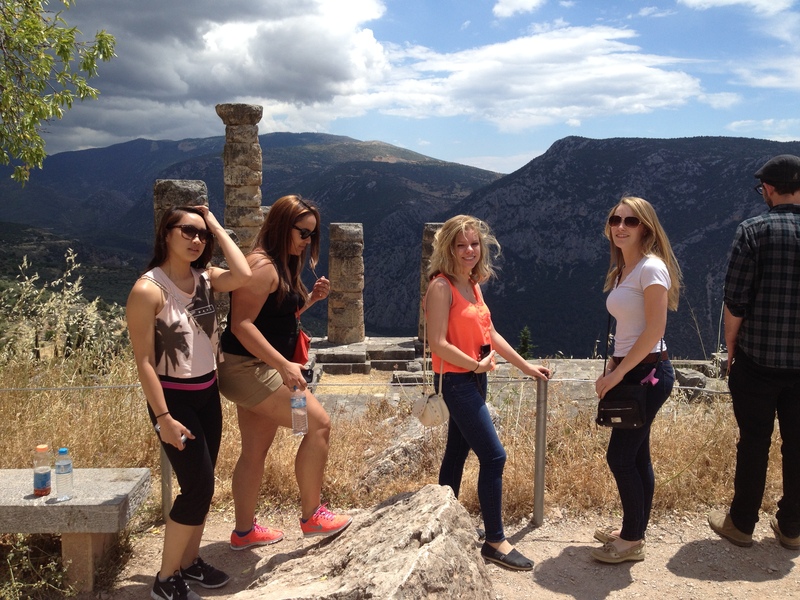 On Wednesday, June 18 at around 11:00 A.M. local time, I parted ways with the students as they climbed aboard a bus headed for the Venizelos Airport. As they said goodbye to one of their favorite resident advisors from the ACG dorm, I felt the pressure building in my sinuses and the water welling up in my eyes, though I wasn’t entirely sure why. I would surely see them again on the UMass Lowell campus, and I had a week left on my own in Greece. In part, I was envious and wanted to join them—five weeks is an awfully long time to be away from home. In part, I was sad for them, that their Greece experience had come to an end. But mostly, I just hate endings and goodbyes. Who doesn’t, right? So, instead, I will dedicate this (likely) final blog post to beginnings. 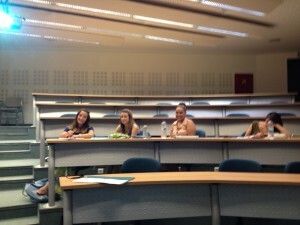 The course and the trip are over, so what kind of beginnings do I have in mind? Almost exactly 29 years ago, when I was just a few years younger than the students are now, I returned from my first European trip. At the time, I had no idea how utterly and completely the experience would transform me. Once we reach a certain age, we can start to assess the impact of certain events and experiences on our lives, and I can think of few experiences that have left a greater or more lasting impression. Knowing the ways in which this adventure altered the course of my life, I want to share some of my hopes for what students will take away from their experience. First, I hope it helps to ignite a lifelong passion for travel, a passion that will take them all over the globe. At UMass Lowell we talk a lot about making students “world ready.” Obviously, no lecture or class discussion or reading can even come close to the kind of “on the ground” learning experience that traveling abroad provides. I hope that students’ open hearts and minds, which spurred them to enroll in the course in the first place, continue to be nurtured and to seek inspiration from new sights and sounds and flavors. On a related note, I hope the trip and the course contribute to an appreciation of diversity and a healthy skepticism toward processes of globalization that threaten to extinguish cultural difference in a way analogous to the threat extinction poses to biological diversity. I also hope that the opportunity to step outside one’s culture and oneself—the critical distance it provides that in turn allows the proverbial fish to finally perceive the water—contributes to the further honing of their critical thinking skills. Too often, the average undergraduate seems to assume that critical thinking just means criticizing other people and new ideas. But it also involves the ability to turn the critical gaze inward, to question our most cherished assumptions. This is a hallmark of the mature mind, a prerequisite for informed engagement in a pluralistic society, and a first step toward the kind of creative problem-solving that might yet save our planet. And contrary to what some contemporary critics of higher education contend, critical thinking does not mean rejecting everything you’ve ever been taught to think, value, or believe, and it certainly doesn’t require sacrificing one’s love of home or country. Indeed, if anything, the kind of critical thinking that travel ideally fosters can actually deepen an appreciation of home, even as it complicates this love. I know it has for me. After all, how can you appreciate a sunny day without ever enduring a rainy one? All of this and more I wish for students. But I better stop now or else risk venturing into the territory of cheap sentiment. So before I tell them that “I hope they dance,” I will bid our few, dedicated readers Για σου (yassou), or, better yet, τα λέμε (ta leme)—we will talk again! 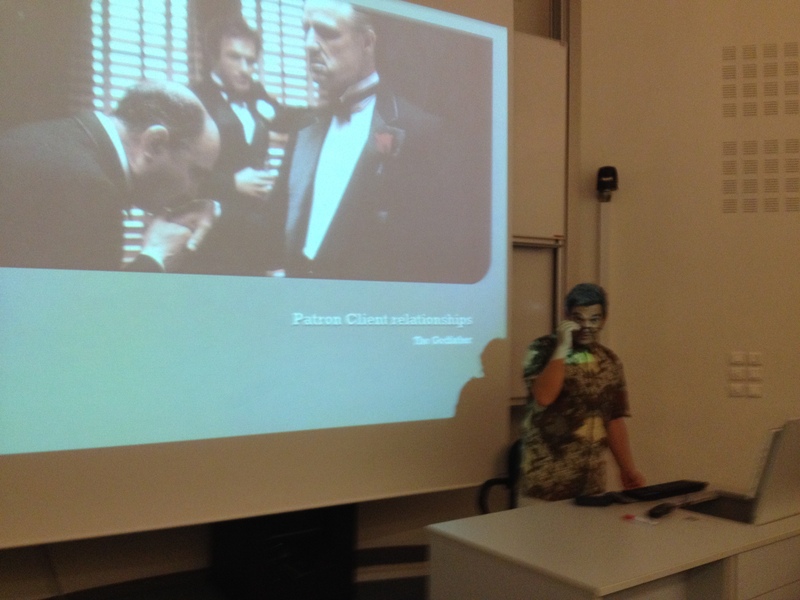 In the second week of the course, Prof. Simeon Magliveras gave a guest lecture on the Greek concept of philotimo and how it relates to patron-client relations in Greece. Philotimo literally means “friend of honor,” and has long served as a moral code for Greeks, governing their behavior and social relationships. As with most “honor cultures,” Greece had long been more collectivistic than individualistic. Collectivistic cultures are characterized by a relational conception of the self and emphasize obligations to others over individual rights. However, with integration into the European Union and increasingly globalization, Greece—like many places in the world—has gradually become more individualistic, and is truly a culture in transition. Nowhere is this more apparent than in changing understandings of philotimo. With respect to the patron-client relations (e.g., politicians and their constituents) that Prof. Magliveras addressed, the obligation to promote client interests as a matter of personal and family honor has been replaced by more materialistic, self-interested motivations (which isn’t to say that political corruption is new in Greece, or anywhere for that matter!). At the level of personal experience, philotimo is now understood more as a matter of honesty and forthrightness that, when absent, reflects poorly on an individual’s character but no longer has the same potential for shaming his or her family (which was once a powerful disincentive). As with all changes, this transformation of a central Greek social and psychological concept has had both positive and negative consequences. As the “honor culture” fades away, women have been accorded more freedom and agency, since they were traditionally defined primarily by their power to bring shame to their family and community if they strayed too far from their prescribed roles as first virgins and then mothers (think about the horrible ending of “Zorba the Greek”!). At the same time, some of the (less repressive) social moorings that philotimo provided have also gone the way of the drachma. For example, one of the articles we read for class reported on a multinational study of personality that found a cluster of traits apparently unique to Greece, one characterized by social uncertainty paired with competition. If this trip has taught us/reinforced anything, it’s that no culture has found the best solution for all the shared social and psychological challenges we face as humans. We Americans tend to be quite fond of the “politeness culture” (though we constantly bemoan its decline) that serves as social glue for our very individualistic populace. But Greeks (and many others) find our version of politeness somewhat inauthentic, and they appear to be a culture in search of a new animating social force to replace what they have lost and what they mourn. 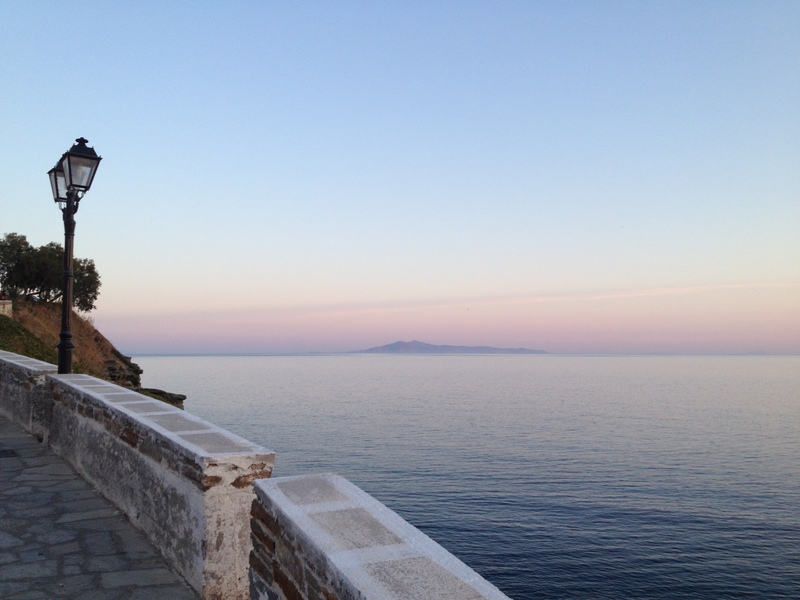 The Perfect Day in Greece? Several years ago, I traveled with family members to Ireland. While much of the trip did not live up to expectations, we had one glorious, fairly impromptu day of touring on the Ring of Berea in County Cork that thereafter became known as “The Perfect Day in Ireland,” or PDI for short. This day—which included kayaking with seals, meandering through the ruins of two castles that were privately owned and which we had all to ourselves aside from grazing cows, a harrowing (but well-worth-it) gondola ride to tiny Dursey Island, and then tea and scones at small café overlooking Kenmare Bay—has long set a travel standard for me (and a very high bar). 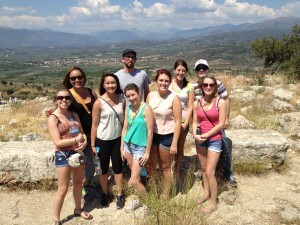 On Saturday, June 12 our outing to Mycenae, Nafplio, and Epidaurus came very close to matching that legendary day. From the moment I hopped aboard our little touring van, I had a smile on my face and a premonition of good things to come. Although we were thrilled with our Delphi tour guide, she had nothing on Hera, who spent the entire day with us, imparting historical, cultural, political, economic, and geographic knowledge from our pick up at 8:00 AM (well, there were some stragglers) to drop off at 6:30 PM. Our morning started with coffee near the impressive Corinth Canal. Snapping a picture of two from the crowded little foot bridge is obligatory, except perhaps for those who are squeamish about heights. We arrived at the historic site of Mycenae, a citadel that Agamemnon once called home. 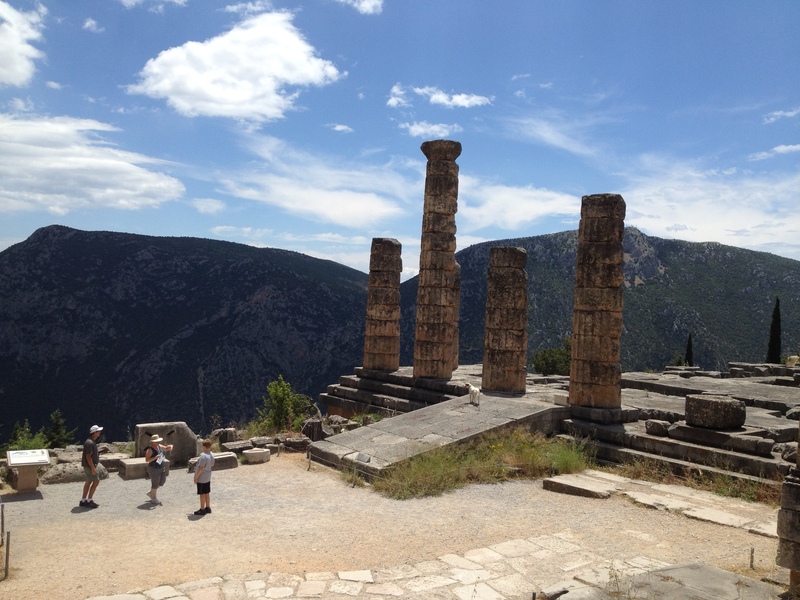 Although the ruins are somewhat limited, the panoramic views of mountains and see were absolutely stunning, and we couldn’t have asked for better weather. 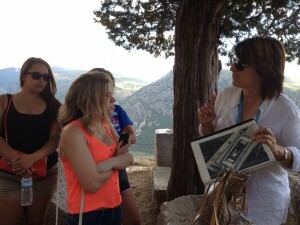 We concluded our tour of Mycenae to a very impressive tomb (for whom no one really knows) dating to about 1,250 BCE. 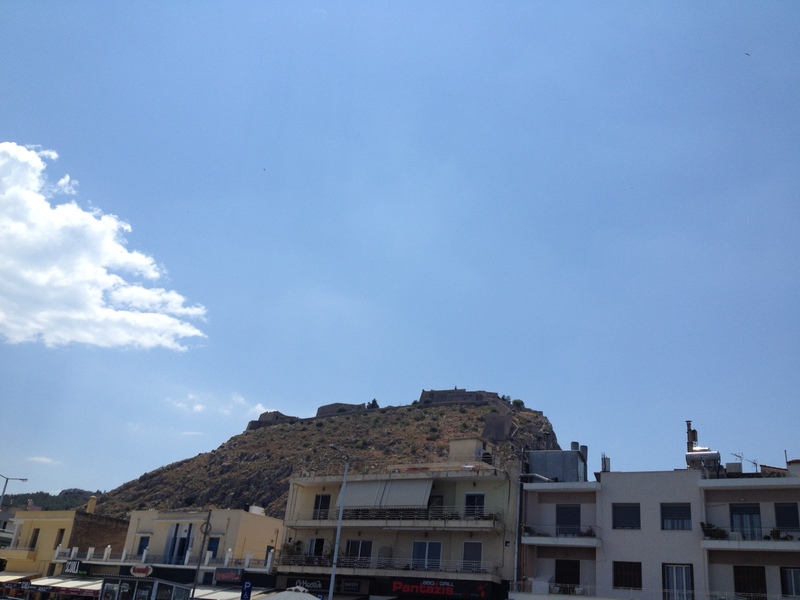 Then it was on to Napflio, which served as the capital of the Hellenic Republic during the Greek War of Independence, for a walking tour and lunch. The city features an impressive fortress on top of a very high hill, and a charming “old quarter” with architecture mostly dating from the revolutionary period (early 19th Century). After walking around a little, we headed for Vasili’s Taverna, where a traditional Greek meal awaited us, including Greek salad, spanakopita, and oven-baked lamb. 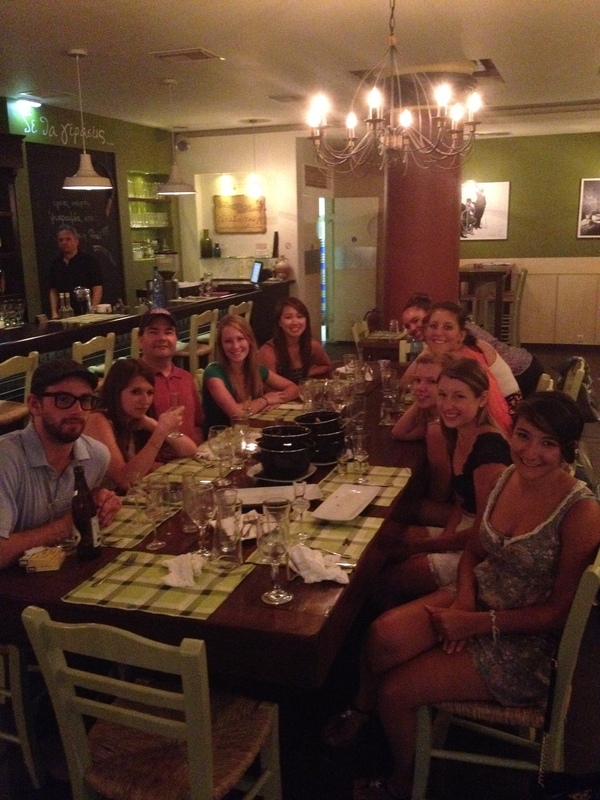 An hour and a half and several courses later, we were all happy, relaxed, and satisfied, if not a little stuffed. But when Hera suggested that we visit an authentic Italian gelateria nearby, somehow we all managed to find room for (a second) dessert! 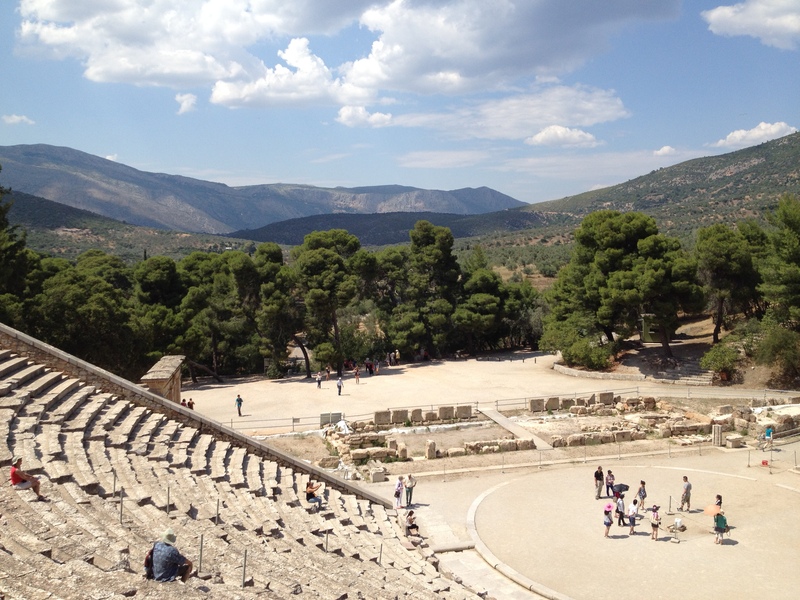 Our final stop was at the theater and healing center at Epidaurus. 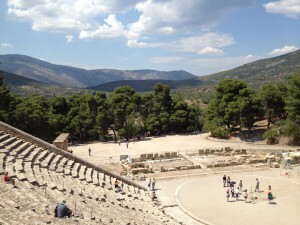 The theater is still in use, and, although the stage itself was destroyed long ago, the stadium seating is largely intact. The steps to the top offered quite a work out, and the last stretch was a little too steep for some folks, but the views from the top were worth it. At the theater, we met some very well-behaved junior high students from New York—I was very impressed by the teachers and chaperones who brought 12- and 13-year-olds across the Atlantic! 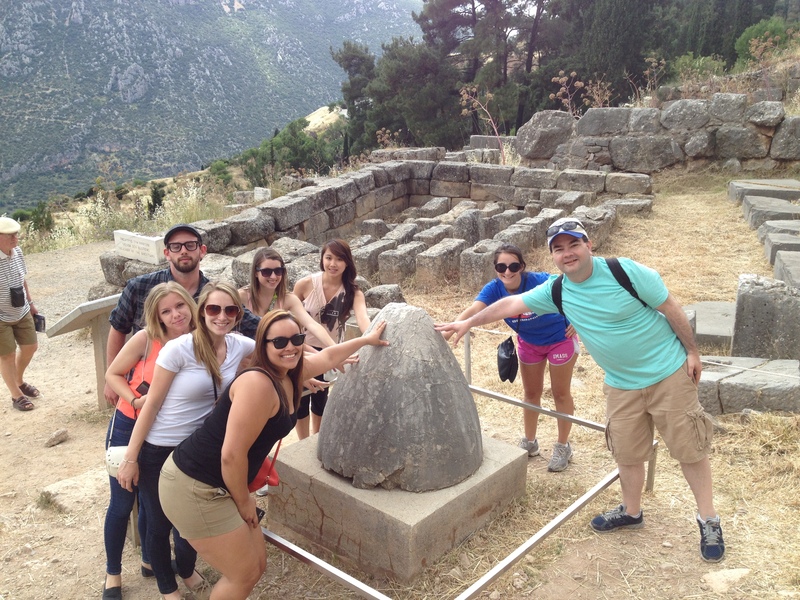 The ruins of the Healing Center were of particular significance to the Nursing Students, who had been looking forward to this portion of the trip for months. 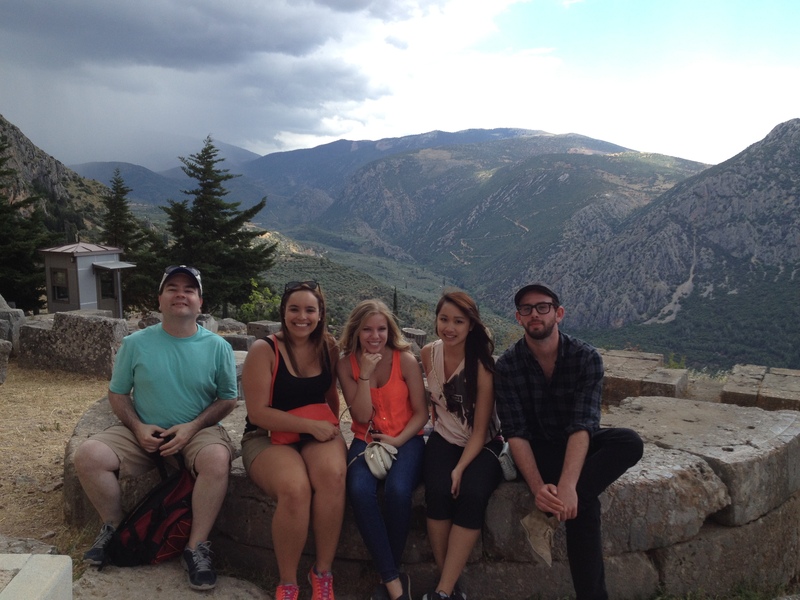 Given it was a long day spent largely on our feet, the long ride back to Aghia Paraskevi was mostly spent napping. We all returned “home” (i.e., to the residences) in agreement that this had been one of our very best days here. 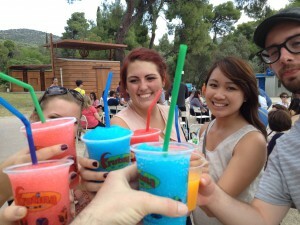 This is my third visit to Greece, and it certainly ranks among my favorite days. As part of their first assignment, students reflected on their experiences of culture shock or “cross-cultural surprise.” The most commonly mentioned experiences had to do with fast and seemingly-reckless driving behavior and lack of parking regulations (or at least lack of enforcement), the ubiquity of dog poop and graffiti, and the perceived rudeness of certain Greek people (and one pretty egregious expression of anti-American sentiment). Students were asked to think about these experiences in relation to their expectations and the values reflected by these expectations. Finally, students were asked to locate their experiences of cultural difference with respect to the well-studied distinction between individualism and collectivism. Adding to this line of analysis, we have been talking in class about how politeness toward strangers, in general, is something we would expect to see in an individualistic culture, versus a collectivistic emphasis on family and one’s reference group and somewhat less hospitable attitudes and behaviors toward strangers. 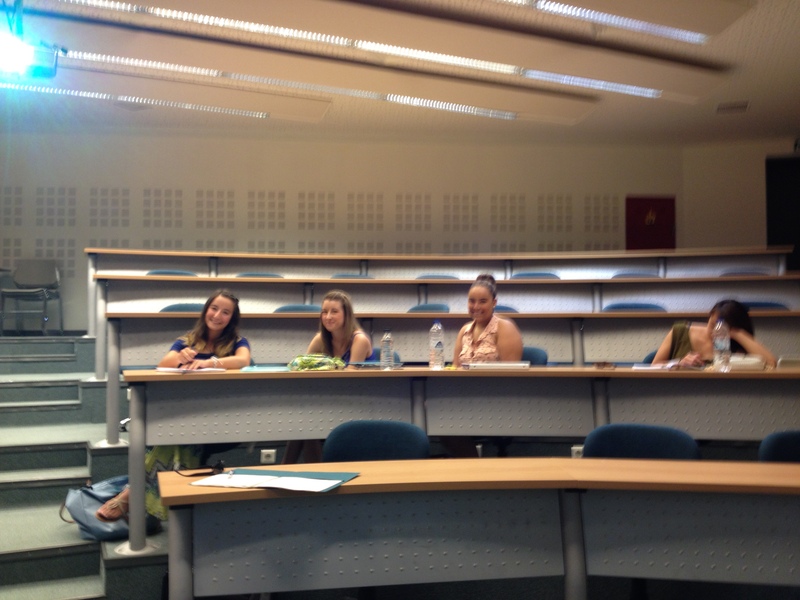 We also discussed how Greece is a culture in transition from more collectivistic to more individualistic modes. But while it ranks somewhere in the middle on this cultural dimension relative to other nations, it ranks at the very top in terms of uncertainty (i.e., in the face of cultural change), which is perhaps not surprising given the ongoing economic crisis. Knowing this has helped us to contextualize the currently volatile politics, and the otherwise baffling prevalence of graffiti, even in the wealthiest neighborhoods. Specifically, graffiti is a form of youth protest here, as we have been told. Our increasingly complex perceptions of our host country will become even more so this Friday, when an ACG anthropology professor will speak to the class about the Greek concept of philotimo, which combines ideas about pride and hospitality—a combination that may seem a little strange to the average (American) Northeasterner, but which is apparently central to Greek culture. More soon! 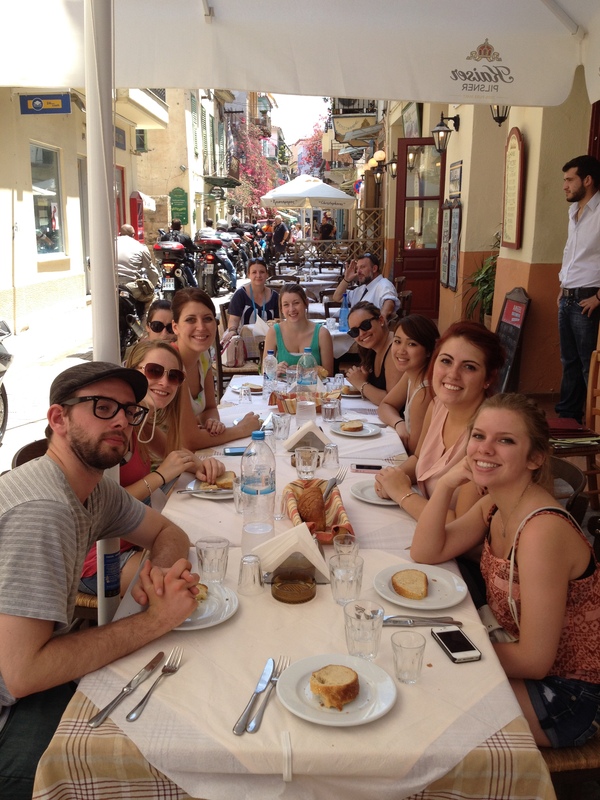 Everyone also seems to be enjoying the food, and I and several students have had very positive experiences at a particular restaurant in the neighborhood where we’re staying (Aghia Paraskevi). It’s a relatively new restaurant that specializes in modern Cretan, tapas-style cuisine, using the freshest ingredients (as we were told). The only employee that speaks English is the chef, who, it just so happens, studied in Boston! During our (separate) visits, the chef took us under his wing, picking a special tasting menu for us and chatting about politics and culture. Among the six small plates that he selected for me were the best stuffed grape leaves I have ever had, an incredibly tender and spicy pork dish, a fresh, vibrant beet-and-greens salad, and a pasta dish with goat meat (this is my third time to Greece, but this might have been the first time I ate goat!). The students are fitting in quite well, and have made friends with other students from the U.S. and elsewhere, including some students from Northeastern who were on the same flight with us (one of our students actually sat next to a guy who ended up being his roommate!). Of the things they enjoy the most about the experience so far, students list the food and the weather at the top of the list. (The weather has been mostly sunny, in the 70s, with a sometimes refreshing, sometimes brisk breeze.) When I asked students about their favorite experiences so far, a few of them mentioned the same experience. As described by psychology major and honors student, Jessica Burgett: “My favorite experience so far was Sunday we went into Athens to tour the museums, which ended up being closed, and instead ending up walking through a neighborhood with shops and restaurants. The stores were very nice and not as ‘touristy’ as some of the other stores I have seen. We also ate lunch at a restaurant that was on a hill, the chairs and tables were placed right on the hill and on the stairs. This was a good experience because even though we are tourists, I did not feel it as much being in this particular neighborhood.” Family and Dunkin’ Donuts (!) were listed among the things they miss the most about home. 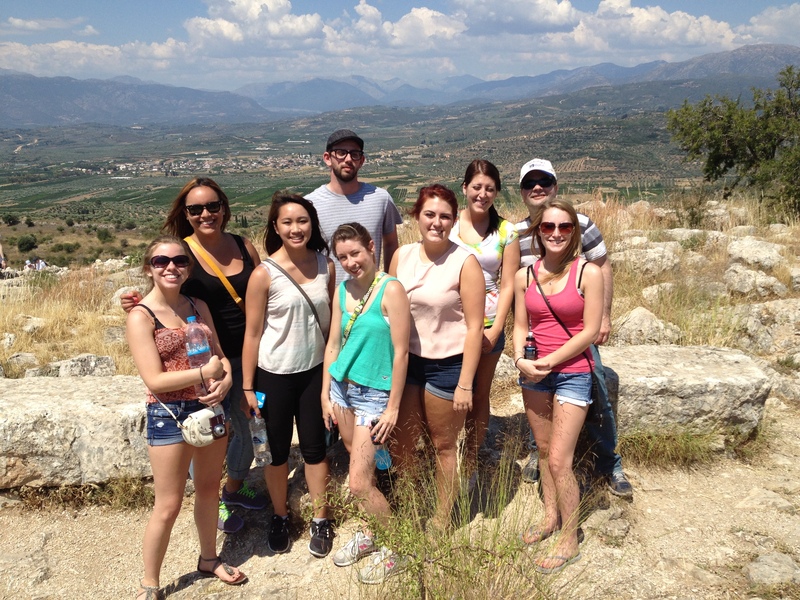 We have three different weekend outings planned as part of the trip, including a tour of the Acropolis and other historical sites, followed by a tour of modern Athens neighborhoods, this Saturday. You can follow our travels through this blog and also by “liking” the Facebook page, “UMass Lowell Greece Summer Session” (https://www.facebook.com/?ref=tn_tnmn#!/UMLGreece), where we will be posting pictures from these outings and other experiences. 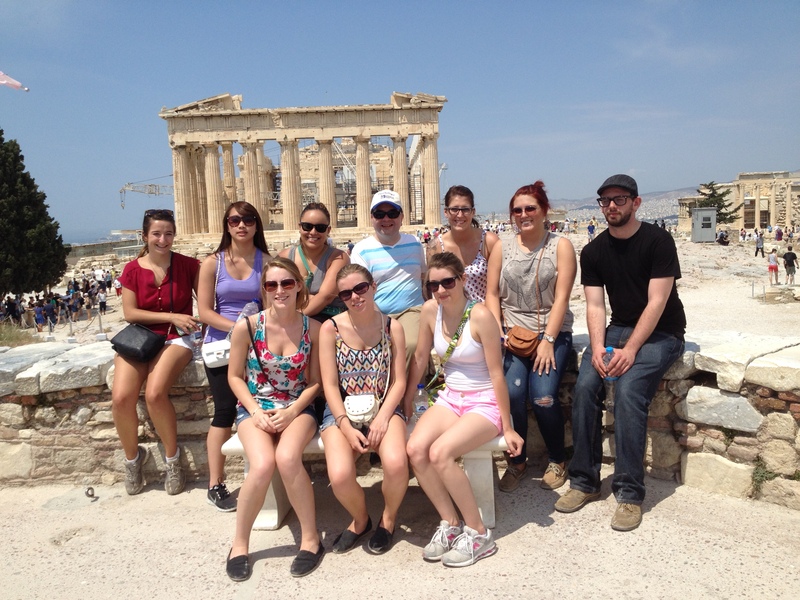 Nine UMass Lowell Nursing & Psychology students along with Professor Andrew Hostetler (Psychology) are studying “Culture and Psychology in Greece” at our partner school, Deree-The American College Greece.